A brand new shape this season, the Big Sur Sweetheart Lightly Padded Top is a super flattering fit. The sweetheart neckline and light padding to this underwired bikini top frames and sculpts your bust line, and the two strap design offers uplift and support. 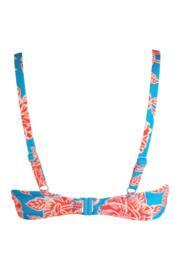 A bow to the centre front adds a final flourish to the look of this gorgeous tropical print bikini. Pair with the Big Sur bikini brief to complete the set. I've given this 4 stars as it's a really nice top......but the style just didn't suit me....so unfortunately I had to return it so didn't bother trying the matching brief. This really is a fabulous bikini. Perfect fit and it looks gorgeous.